The following interview was conducted by phone and email in the last week of March. Aben Resources Ltd. (ABN:TSX.V; ABNAF:OTCQB) appears to be one of the better positioned high-grade gold juniors in Canada, more specifically in the Golden Triangle of British Columbia. The Golden Triangle is to gold what the Athabasca basin is to uranium…. HIGH-GRADE ore…. Aben Resources has a number of things going for it. A tremendous management team, Board & Advisors, a high-grade discovery, and nearly 24,000 ha of property situated between the Kerr Fault (the major structural feature in the Golden Triangle) and the "Hazelton/Stuhini" contact (keep reading to learn the importance of this!). 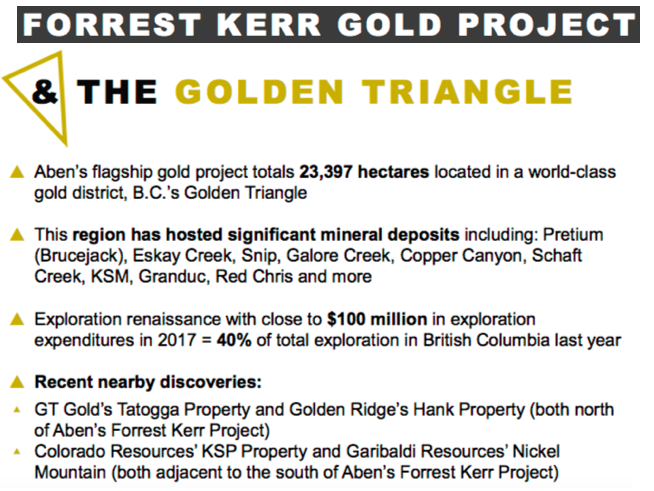 We are on track, setting up the program for our third year of drilling at Forrest Kerr, in the Golden Triangle (GT). We have three really good targets to start with at the Boundary zone. One is slightly north of the North Boundary zone, (NBZ). It came to us though 3D modeling. In the South Boundary zone, we have a good target; it deserves more attention with new pad locations. Last year the angles at which we wanted to drill were restricted by our drill pad locations. This area has very broad, lower-grade mineralization, but it indicates that we are close to something. We could be fortunate, if we do our homework. Finally, there's the old Noranda hole that was very similar to holes in the NBZ. New pad locations will help us there as well, it's about 250 meters south of the NBZ. We're trying to close the gaps between zones of high-grade gold. After two years of drilling, we have a handle on the NBZ, but the overall area is 4 km long by 2 km wide. So, we're starting with a sizable airborne geophysical MAG survey, with 50-meter spacing. It will be flown by helicopter and followed up with a drone to further define certain areas. We want to get a handle on the larger structural features. We need a large amount of definition to get a good handle on a pretty complex area. A lot of geological events have happened there. Lots of gold, but it's all about getting a handle on where it's coming from. The Hazelton/Stuhini (HS) contact is the Holy Grail in the GT, but this "Red Line" theory that's been touted by the BC Geological Survey isn't just about that. Highly prospective properties must also have a correlating structural feature that's fairly dominant, and within 2 km of each other. We are halfway between the HS contact and the Kerr Fault. Readers should understand that the Kerr Fault is the major structural feature in the entire region. We are in the prime discovery area. Around us everyone has staked ground, perhaps half are within 2 km of the Red Line, but not all are also near a major structural feature. Can you describe your management team's and Board's backgrounds? We have a number of people on our website, I will mention just a few. Tim Termuende is a director and is very active along with me, he started his career in the GT working under Ron Netolitzky, M.Sc. Geology. Tim is a P.Geo with over 30 years' experience. He's CEO of Eagle Plains Resources and a director of several other companies. Tim has very extensive experience in the Americas, but what we really like is that he has been involved in exploration within the Forrest Kerr, BC, area off and on since in the early 1990s. Chairman of the Board Ron Netolitzky, one of the best known names associated with the GT, is credited with three major gold discoveries in Canada that have subsequently been put into production; Eskay Creek, Snip and Brewery Creek. Ron really likes us, he's known me and Tim a long time, we worked together in the Yukon, we get along well. Cornell McDowell is a really good field geologist, he's VP Exploration, and is heading up exploration efforts at Justin as well. Mike McCuaig is a geologist with extensive experience in grassroots exploration, having worked on a number of projects across British Columbia, he's a good, young Geo who's been with us since 2011–12. He's project manager at Justin.